Every once in a while, I get a request for a specialty cake. Most often, the request is for a dairy free cake. And since chocolate is one of the most popular cake flavors, it’s important to have a great dairy free chocolate cake. 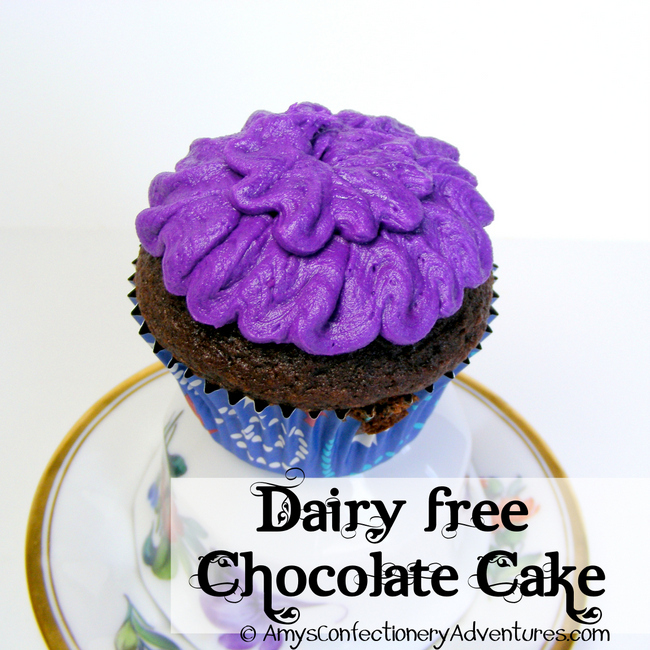 Here is my favorite dairy free chocolate cake – because everyone needs to be able to enjoy a slice of chocolate cake! *Check labels carefully to make sure the cake mix is dairy free. Several name brand and store brand mixes are dairy free. Cool the cakes on wire racks in the pans for 10 minutes. Then run a knife along the edges of the pan and invert. Cool the cakes completely. Then decorate as desired with buttercream & MM Fondant. I am very impressed with your baking skills Amy. That is a beautiful cupcake! This was sooo well done and it's so nice that you created something for those who are dairy free! Sounds like a great recipe and looks good too :) Thanks so much for sharing with us at Weekend Wonders! Hope you're enjoying your week so far! This looks awesome! What a great idea...there are so many dietary concerns, and everyone deserves to eat chocolate cake! Easy and delicious! Perfect for those with allergies! Thanks for sharing it at Pint Sized Baker's Two Cup Tuesday party. I've pinned this and I hope to see you again on Monday night! Nice cupcake, I want to ask you what size pan do you use?